We simply love doing a living room refresh. Why? Because there are so many fun possibilities. But, instead of going into the endless possibilities of refreshing your living room, we want to focus your attention on three simple categories that offer the greatest impact: draperies, rugs and pillows. Ever walk into someone’s living room and just love how it feels? But, when you think about it, you can’t quite put your finger on why? That’s the power of draperies. Draperies can do wonders for a room. Model homes use them to add to the height and grandeur of a room. You can too. One of our favorite drapery tactics is to use single width draperies. They do incredible things to a room and make your living room look custom. They add height. They can add incredible color and eye-catching patterns. The options are endless. When you order custom sizes and get the right lengths, and length does matter, you can really change the direction of your living room space and set an entirely new tone. Draperies are a simple solution but make a tremendous difference when you’re doing a living room refresh. We don’t actually want you to float your area rug in the water, but we do want you to think of it as a boat or a raft. Here’s why. People do area rugs wrong, most of the time, but we’ve found, when they think of them as a boat or a raft, it offers the right visual to do them right. In fact, when done right, an area rug will make a huge impact for a living room refresh. When you think of your area rug as a boat, it should cover the bulk of the floor with little room on the sides. All of your furniture then sits on the rug – or “in the boat”. It’s a more traditional use of an area rug but it does a few things. It makes your room look bigger and more grand. And, it can cover up the existing floor you hate, but can’t afford to replace. Another option, and one we like when done well, is to layer area rugs. We do, however, recommend you seek some guidance if you want to layer area rugs. When done properly they can be an incredible, textured addition to a living room space. But again, seek some help on the layered look before you purchase rugs for a space that just won’t do the room justice. Overall, rugs, either as boats, rafts or layered, can pull the whole space together in terms of color and texture. They allow you to go from a more traditional look to a more modern one or vice versa. We’d love to tell you that you can never have too many pillows – like you can never have too many shoes – but we’d be lying. But don’t get us wrong. We love pillows, just not too many of them. During a living room refresh, however, they can have a huge impact. For starters, let’s talk numbers. 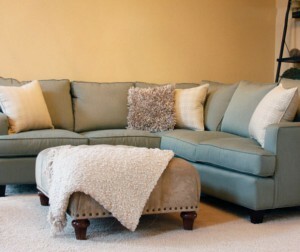 We recommend three pillows for a sofa and five for a sectional. Enough, but not so many you have to remove them to sit down. Nicely sized, over-scaled pillows can add a lot of look. Custom pillows add a lot to a room and really change the look of the space considerably without having to refurnish the room. You can choose from a variety of textures, colors and patterns. To add a more organic feel, add trimmings on the edges. We recommend investing in good pillow inserts made with a poly-down fill. They hold up much better and will look as new today as they do 10 years from now. When your covers start to wear or look dated, or you want to change them for the season, simply swap out the covers but use the same inserts. One final pillow idea that can refresh a space is to get really large pillows – also known as floor pillows – and cluster them around a bookshelf, or your fireplace. Floor pillows are nice to consider and look designery. We love talking about refreshing living rooms (and other spaces for that matter) but if you follow our three categories – draperies, rugs and pillows – you will be amazed at what you can do without breaking the bank. And, if you want to see some great options, stop in and talk with us.